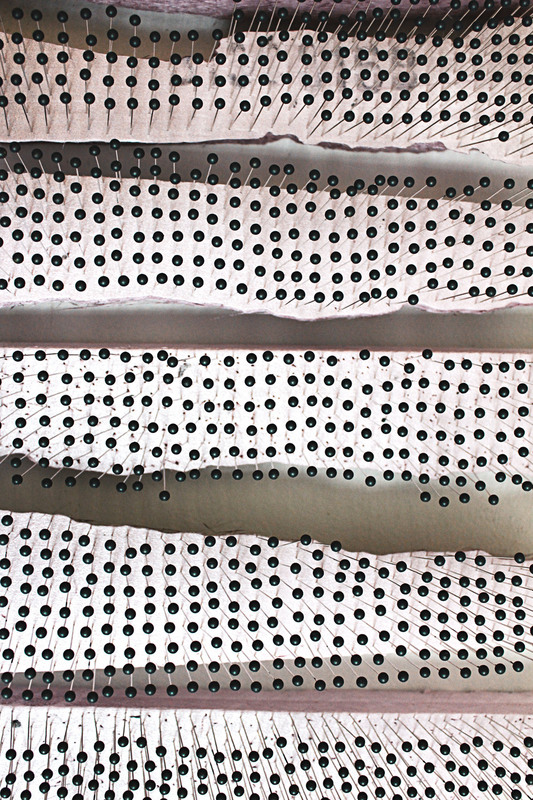 When preparing for the BFA show at the DesLee Gallery in St. Louis, I wanted to have a piece using the quilting pins. Studio Topology was site specific to my studio wall and therefore couldn't be shown at a gallery. Stars Visible to the Naked Eye uses the same quilting pins from Studio Topology, but marks the accumulation of visible stars instead. The process plays a huge in the new gallery piece, as I wanted black pins instead of yellow ones. Since repetition was a key concept in my thesis body of work as a whole, I embarked on a challenge to hand dip each yellow quilting pin black- all 3600+! I sat at my studio desk and dipped each one over a three day period, watching almost two entire seasons of Alias on Netflix. In the end, the process of dipping the pins became the drive of the piece, as it was one of the most ridiculous form of repetition I'd embarked upon, 79 ft croqueted scarf included.